Your solution to create a professional church directory. | Instant Church Directory. Produce a Professional Church Directory Anytime, Anywhere. Gone are the days of printing and distributing a church directory that is immediately outdated. You CAN produce a professional church photo directory yourself in just hours. Access information with peace of mind because your members data is safe and secure. 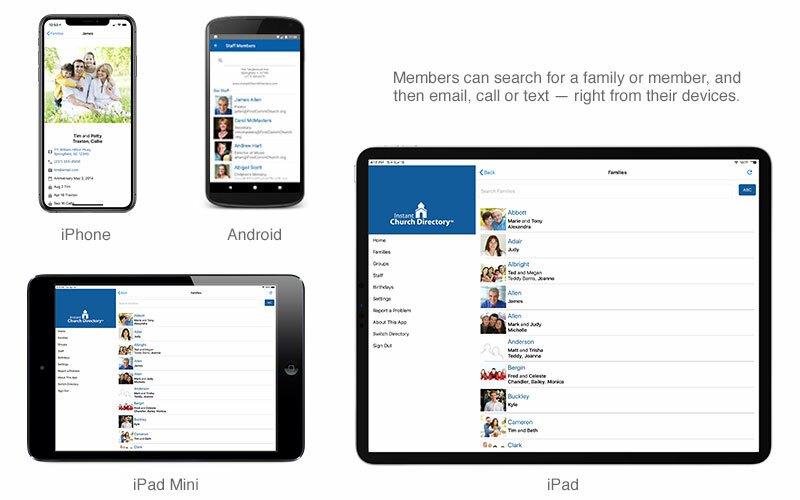 Our mobile apps and online member directory allow you to view, search and utilize family, individual and church group information. 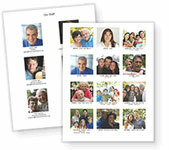 Print your Photo Directory in B&W or full color – and link it securely to your church’s website. 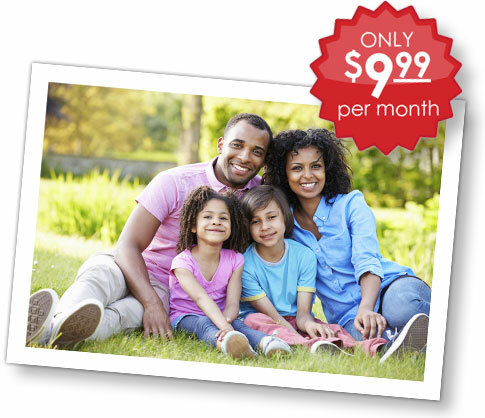 With Instant Church Directory, you're in control of your members' photos– they won't feel pressured to buy portraits they don't want or need. Easy to create your Church Directory. Keeping your members' data up-to-date is in your control, and we take you through the process, step by step. Maintain specific family member details such as church member status, birthday date and if a family member has a different last name than the family name. Quickly add birthdays to any member in your directory. The birthday page displays your members' birthdays by month. Two custom fields are also provided in our software program that allows you to add any specialized information to each family entry. One field prints on the roster pages. Add individuals or families to a group and then print a directory just for that group! You can create as many groups and sub-directories as you want. If you want a traditional, printed directory, you used to wait for a company to do it for you. Instant Church Directory gives you the option to make a protected PDF that you can print and distribute yourself. Export your directory data any time. You can use this exported CSV file in other applications that can read a CSV file. For example, use it to create envelopes or mailing labels using Microsoft Word Mail Merge. With just a few clicks, you can change your directory from an 8.5" x 11" size to a booklet size of 8.5" x 5.5" and print as many copies as you need in black and white or full color. A unique hyperlink is provided with which you can share your directory on your church website. Easy to share your Church Directory. Once you have completed your directory, distributing it is easy. Instant Church Directory provides you with more options to share your directory to help reach all your members the way they wish. With the Online Member Directory, your members can now view your Church Directory from any computer. The Online Member Directory works just like the mobile app but is viewable online in a browser window such as IE, Firefox and Chrome. Now you and your members can sync your church's directory right to an iPhone, iPad, iPad Mini, Android device or Kindle Fire! Members can search for a family or member, and then email, call or text — right from their device. Plus, any change you make to the online directory is immediately synced with their device—so you always have the most up-to-date directory available. Even with electronic access to the directory via mobile apps or the online member website, many churches want a traditional printed directory — especially for member who are seniors. Instant Church Directory easily provides a PDF that you can print yourself in a few easy steps or take to a local printer. Easy to update your Church Directory. With Instant Church Directory, you can make as many updates to your directory as you like, as often as you like—anytime, anywhere. Keep your member information up to date anytime or anywhere with convenient log in from any computer – at home or right in your church office. With our FREE mobile member apps, now you can take your Church Directory access on the go. How you choose to incorporate photos and obtain them from your members is totally in your control. With Instant Church Directory, you can have volunteers take members’ photos on a given Sunday or at any church event. Or, you can request that members provide their own photos for the directory through the program, and then you can approve them before they appear in the directory. Whether you request photos from your members or take them yourself, our image upload tool makes handling one photo or multiple photos a simple task. Your church family evolves over time — it’s a fact of church life. Members relocate, get married or, sadly, pass away. The Instant Church Directory software program allows for these necessary changes and updates to keep your directory not only accurate, but safe and accessible to only members who should have access to its contents. Instant Church Directory makes managing the family members' and individuals' information user-friendly and easy. Gain complete access for 30 days, absolutely FREE. If you like Instant Church Directory, do nothing and your membership will continue automatically after your free trial period is over. All your information will be saved so you won’t have to start over. 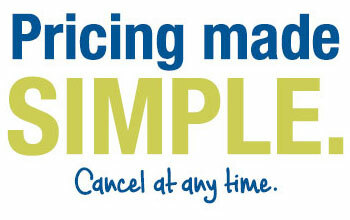 Pricing is Simple. No plans. No contracts. For just $9.99 a month, you’ll receive access to all our features. There's no complicated tier pricing based on the number of members, and no annual contracts are required. Furthermore, your members won't have to pay for the mobile apps or online access, or even feel pressured to buy photos. Instant Church Directory is your Church Directory solution. Read what others love about Instant Church Directory! This is amazing! Easiest, by far, software I have ever used! Took me 10 minutes to create a sample directory of about 8 pages long. Thank you!!!" You have a great, easy-to-use program. We already have much better quality than our last commercial photo directory, and our amateur photographers are having a ball with it. The congregation likes the photos better instead of the stiffly posed commercial ones. We are very happy with our new Church Directory. Your program was so user-friendly, and the result was a very professional product. Instant Church Directory is a wonderful program and so easy to use. Everyone is so impressed -- I am ashamed to tell them how easy it has been!" This is the best online tool I have ever used. The tool itself is so easy to use; I have found it to be flexible; it prints nicely; and the support you provide is super! The price is more than worth it!" Love this app. I am a pastor and love this app. First, it is easy to use and update. Secondly, it has helped build community in our church. If you forget someone's name, or their children's names - just look it up on the spot, find their picture, and you're good. I have talked to so many people at lunch or breakfast meetings and a name comes up of someone they don't know - I look that person up and can show them their picture. Thirdly, if you visit someone or are headed to a home group for the first time, just touch their address and the map to their house appears on your phone. I also use it to pray for people - just go down the list... We update it regularly and it saves trying to print updates all the time. - Lastly, and most obviously, you have everyone's phone number right on your phone. Love this thing!" Our faith family has been using this for over a year, and everyone raves about how handy it is to have contact information at their fingertips! They love that it is so easily updated. The new email broadcasting feature, and the soon-to-be implemented text broadcasting feature make it just that much better! I can't say enough good things about the value for the price!" Simply the best church directory app available! Super easy to setup and use. Adding members and information is a breeze. Registering each device is fast with personalized password emailed to member instantly. Members love that after they login the first time, they don't have to login again. Love the ability to click on phone number to make a call, click on email address which opens your email app to instantly send an email, and the ability to click on street address and GPS app opens instantly and shows you how to get there."